What’s the weather like today? If you can tell it’s hot and sunny (or raining!) just by sitting inside your windowless office, it may be time to look at the well-being of your commercial roofing system. When shopping the market for a new roof, the most important thing to keep in mind is the overall health of the building. Factors like the longevity of the roof, typical weather variations and energy efficiency are critical. Each commercial roof type has its pros and cons, and making a decision is more difficult than ever before due to the variety of options available. Read on to learn about the seven most common options, and what environments they are best suited for. The trifecta of purchasing a new commercial roof: durability, energy efficiency and cost. Efficiency has been a buzzword for years now, and many cities have added energy efficiency parameters to their permit process. Of course, as a business owner, you are concerned about energy efficiency, too, since it can save you quite a bit of money in the long run. Lastly, but often most important, the overall cost of new or replacement roofing will certainly be in the back of your mind. Some systems cost less to install, but make sure you’re not sacrificing durability or efficiency to save a few pennies up front. Durable metal roofing is a very popular commercial roof type because of its 40 to 60 year lifespan. There are several different types of metal roofing systems available, and some even come with integrated solar or integrated snow removal systems. Metal roofing can have an attractive, finished look, strong fire resistance ratings and are stronger and more sustainable than many other options. Downside: Metal is susceptible to corrosion. Because of this issue, modern metal roofs have protective surface layers added to manage damage from exposure, moisture, pollution and other environmental factors. Built-up roofing has a lifespan of 20 years or more with care, and it is made by alternating layers of tar and gravel. The number of layers affects durability and (ultimately) cost. It is inexpensive and easy to repair, and is one of the oldest and most flexible roof types. This type of seamless roofing holds up well to foot traffic but depends on its stable understructure to carry the weight and vibrations of movement. It is UV-resistant and may be coated to reflect heat. Downside: BUR roofing’s lifespan is one of the shortest around and it can be difficult to identify the source of a leak as the roof ages. A green roof can last from 30 to 50 years. They consist of a tough waterproof membrane covered completely by green plants. These sustainable masterpieces improve air quality and often add a green space for relaxation and rest for employees. Advantages include protection from the elements, possible utility and government incentives and improved aesthetics. Often they have sophisticated water and drainage management, climate control and sensor capabilities. Downside: Green roofs do require ongoing maintenance and monitoring. In short, Spray Polyurethane Foam (SPF) is a material that begins as a liquid spray that instantly expands into a foam, which hardens into a solid layer. This particular eco-friendly roofing is applied on top of an existing roof, and although not well-known, has been around since the early 1960’s. An SPF roofing system waterproofs and adds an insulating factor. It can be used in any climate and will last up to 50 years with correct installation and maintenance. Downside: The installation window for this particular roofing type is limited to favorable weather conditions (no snow, no ice, no water), and once installed, SPF roofing should be inspected once or twice a year. Ethylene Propylene Diene Terpolymer (EPDM) is a roll-based, durable synthetic rubber roofing membrane. Also known as Thermoset roofing, an EPDM roof system offers strong resistance to sunlight and pollution. It’s long-lasting, versatile and easy to install. EPDM comes in white and black rolls, and in addition to sun and pollution resistance, this single-ply rubber is durable in the face of many common solvents like alcohol, or acids. Downside: EDPM is not necessarily the “prettiest” option on the market, and it can puncture easily (think falling debris or people walking on the roof). Thermoplastic Polyolefin (TPO) and Poly Vinyl Chloride (PVC) roofing systems are adverse conditions resistant. UV light, chemicals including fats and oils, or bacterial growth are all slow to damage these types of roof membranes. They are lightweight, heat-reflective, and puncture resistant. Other benefits include strong air-welded seams, fire-resistance, and tolerance of both high temperatures and high winds. Downside: Beware of cheap, poorly made products. Since TPO has become so popular, many small manufacturers have tried to create their own product lines, allowing quality to slip through the cracks. Be sure to purchase this type of product from a reputable manufacturer. Most commonly seen on residential buildings (probably your very own home), shingles are also used on commercial properties — typically ones that have steep roof lines. Shingles come is numerous materials, including asphalt, architectural, slate, plastic and ceramic (just to name a few). This material is relatively easy to install, affordable, and versatile. Downside: Depending on the brand used, lifespan isn’t as long as some of the other commercial roofing types. Shingles are also susceptible to mildew and moss if your building is located in a shaded area. If your commercial property needs a new roof or you’re considering all types of commercial roofing material options for a new build, think about what might be right for you. Different climates and different type of building usage SHOULD affect your choices. Consider the longevity of the roof and its annual maintenance cost. Also, consider the energy costs of the various types and colors of roofing materials. Cold weather climates may find a dark-colored roof reduces their heating bill, while warm climate offices may demand a white roof to limit the strain on their air conditioner. Are you searching for answers about commercial roof types? 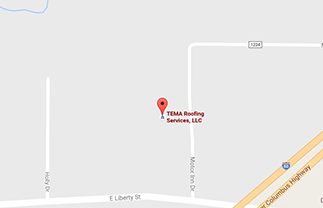 TEMA has three generations of experience working with all kinds of roofing materials, and we’re proud to say that we’ve installed more than 50 million square feet of commercial roofing! Let our experts walk you through all types of commercial installations. We know roofs: EPDM, PVC, built-up coal tar, modified bitumen, metal and more. We work to ensure that the three most important factors are always addressed: finding the right roof for your budget, delivering quality work that lasts, and installing the most appropriate roof system for your structure.